The Aggregator is based on and part of the Buckminster project. Buckminster provides a versatile and adaptable framework supporting build, assembly and deployment processes. It supports a rich set of usecases. One of those - the aggregation of repositories - is the focus of the Buckminster Aggregator tool. Organisations or teams want control over internally used components - It may be necessary to have gated access to relevant p2 repos and do an organisational "healthcheck" of those before internal distribution. Furthermore, internally used aggregated repos can provide a common basis for all organisational users. 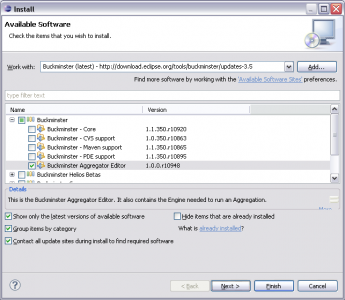 Note: Buckminster Aggregator has moved to the b3 project for Helios (Eclipse 3.6). See b3 aggregator manual for more information. Click the Add... button and enter the URL http://download.eclipse.org/tools/buckminster/updates-3.5 in the Location field. Select the Buckminster Aggregator Editor and click Next twice. Installation of the headless version of the Aggregator is similar to a typical headless Buckminster installation. The following steps focus on the installation of the headless Aggregator feature. Start by Downloading the (headless) director which can be found here (you may also consult the main Buckminster Download page). In the following we provide two simple examples that are easy to replicate and should highlight some of the features of the Aggregator. The first example deals with the creation of two variations of a p2 repo. The second shows the Aggregator's Maven support. Buckminster provides support for Subversive. Apart from the Subversive components at Eclipse (http://www.eclipse.org/subversive/), a complete installation will also require Subversive SVN connectors provided by Polarion (http://community.polarion.com/projects/subversive/download/eclipse/2.0/update-site/). We want to create a repo that combines all these components and makes them accessible from one location and for several pre-defined configurations. The first Contribution to the aggregation is labeled "Galileo 3.5". At the bottom of the model editor view a list of all included repos is displayed. INSERT OVERVIEW OF RESULTING STRUCTURE AND ARTIFACTS ... TBD !!! Mirroring all repo artifacts of your aggregated contributions may neither seem prudent nor necessary. This can be avoided by changing one property for the defined contributions. Each Mapped Repository has property called Mirror Artifacts which can be set to false in order to prevent copying all artifacts of the contributed repo to the aggregated repo. The following buckminster_galileo_redirect.build is a variation of the first example with the Mirror Artifacts property set to false for all contributed repos. Running this aggregation will result in a composite repository that provides an indirection to the contributed repos. A powerful feature of the Aggregator is the ability to create aggregated repos that can be consumed as Maven repos, that is providing the structure and artifacts required by Maven. Those repos can in fact be consumed both as p2 and Maven repos. This flexibility is provided due to p2's separation of meta-data about dependencies and the actual location of the referenced artifacts. 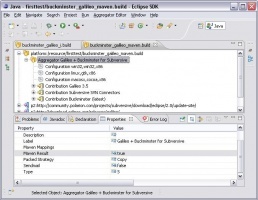 The sample buckminster_galileo_maven.build is a variation of the previous aggregations configured to produce a Maven repo. You will need a headless installation of Buckminster with the Aggregator feature installed. --buildRoot <path to directory> buildRoot declared in the aggregation model Controls the output. Defaults to the build root defined in the aggregation definition. --mockEmailTo <email> ? Becomes the receiver of the mock-emails sent from the aggregator. --mockEmailCC <email> ? Becomes the CC receiver of the mock-emails sent from the aggregator. The root node of any aggregation model is the Aggregator node. It specifies a number of global properties including the Build Root (the target location of the aggregated repository) as well as the repo structure (maven-conformant or classic p2 setup). There are several child components some of which can be reference in other parts of the model: Configuration, Contribution, Contact, Custom Category, Validation Repository, Maven Mapping. Description <string> - An optional description of the aggregated repository that would be visible if accessing the aggregated repository via the p2 update manager. Label <string> - A required label that will be used for the aggregated repository. This would be visible as the repo label if accessing the aggregated repository via the p2 update manager. NOTE that due to the flexibility of p2 (separation of meta-data about dependencies and location of artifacts) the aggregated repo will also function as a valid p2 repository. false Controls whether or not emails are sent when errors are detected during the aggregation process. A value of false disables sending of emails. This includes mock emails. Contributions are the key element of any aggregation. Contributions specify which repositories, or parts thereof (category, feature, product, IU), and according to which constraints they should be included in the aggregated repository. A contribution definition may consist of several Mapped Repository and Maven Mapping components. Description <string> - Optional description of the contribution. This serves documentation purposes and will not end up in the aggregated repository. true Disables (false) or enables (true) the contribution for the aggregation process. Note that this may lead to missing dependencies and hence verification errors. A Contribution may define several Mapped Repositories defining the actual content of the contribution. The Aggregator provides a fine-grained control over the contribution from each Mapped Repository through references to Products, Bundles, Features, Categorys, Exclusion Rules, Valid Configuration Rules. Category Prefix <string> - A prefix added to this repositories' label when displayed in the p2 update manager. In the absence of custom categories this allows a useful grouping of repositories in an aggregated repository. Location <URL> This specifies the location of the repository that should be added to the enclosing Contribution and is a required property. 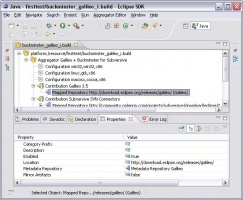 Defining Product components allows to add individual Eclipse products to the aggregation (when defined as part of the repository) rather than the complete contents of a given Mapped Repository. Installable Unit <product IU> - A reference to the product to be included in the aggregation. Valid Configurations <Configuration>* - References to zero or more configurations for which this product has to be verified. If no references are given the product has to be verified for all Configurations defined for the aggregation. Defining Category components allows to add individual categories provided by the contributed repository rather than the complete contents of a given Mapped Repository. Installable Unit <IU> - A reference to the category to be included in the aggregation. Valid Configurations <Configuration>* - References to zero or more configurations for which those category's contents have to be verified. If no references are given the category has to be verified for all Configurations defined for the aggregation. Defining Bundle components allows to add individual Eclipse bundles to the aggregation rather than the complete contents of a given Mapped Repository. Installable Unit <IU> - A reference to the bundle to be included in the aggregation. Defining Feature components allows to add individual Eclipse features to the aggregation (when defined as part of the repository) rather than the complete contents of a given Mapped Repository. Furthermore, this component provides the means to group features implicitly into Custom Categorys. Categories <Custom Category>* - Optionally references the Custom Categorys into which the feature should be placed upon aggregation. The relationship to the custom category is bi-directional so adding the feature to a custom category will update this property automatically in the Custom Category definition, and vice versa. Installable Unit <IU> - A reference to the feature to be included in the aggregation. Valid Configurations <Configuration>* - References to zero or more configurations for which the referenced feature has to be verified. If no references are given the feature has to be verified for all Configurations defined for the aggregation. Exclusion Rules are another tool providing control over the aggregated repository. An exclusion rule may reference any bundle, feature or product to exclude. The excluded IU will not be considered in the aggregation and verification process. Each exclusion rule can only reference one IU. Installable Unit <IU> - Reference to any IU (product, feature, bundle) in the enclosing Mapped Repository that should be excluded from the aggregation. By default all contributed contents of a Mapped Repository will have to be verified for all Configurations defined for the aggregation. A Valid Configuration Rule allows constrains this and defines and exception. For an IU (product, feature, bundle) referenced by this rule only chosen subset of configuration will be verified and aggregated. Installable Unit <IU> - Reference to any IU (product, feature, bundle) in the enclosing Mapped Repository for which only the referenced configurations should be verified. Valid Configurations <Configuration>* - References to one or more configurations for which the referenced IU has to be verified. This implicitly excludes verification and aggregation for all other Configurations defined as part of the aggregation model. Defines a resuseable contact which can be referenced in other parts of the model and may be used to send notifications about the aggregation process. A Custom Category provides a grouping mechanism for features in the aggregated repository. A custom category can be referenced by Features defined for inclusion from a Mapped Repository. The relationship to the between custom category and a Feature is bi-directional. Thus, adding the feature to a custom category will update this property automatically in the Feature definition, and vice versa. A Validation Repository defines a repository that may be required to satisfy dependencies for the aggregation but whose contents should not be included in the aggregated repository. It supports the cases where the objective is to create a repository that is not self sufficient, but rather a complement to something else. The Aggregator supports the creation of Maven-conformant repositories. 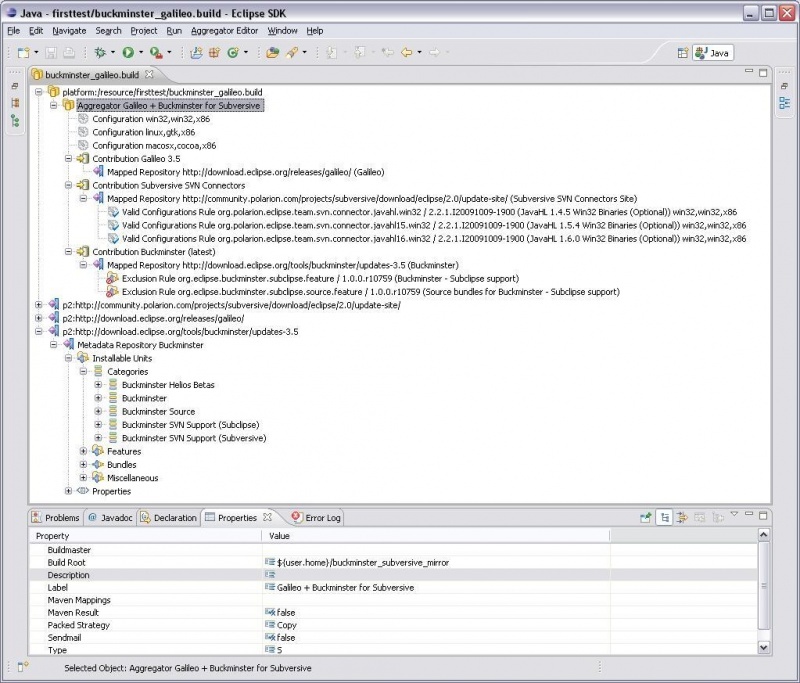 Those require a structure and naming conventions that may have to be achieved by a transformation of the Bundle-SymbolicName (BSN) when working with Eclipse bundles found at contributed repositories. Custom transformations are supported by the definition of one or more Maven Mappings which can be defined at the Aggregator and the Contribution level.